Play houses for energetic toddlers! KIds playhouses often include additional play activities. Slides, swings or climbing equipment allow your children to use these houses for exercise and also as a pretend play toy. The big advantage of an inflatable play house is that it needn’t be a permanent fixture in your backyard. It can be deflated and easily stored away when the bad weather comes or when you need to use your yard for other things. 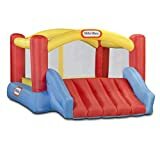 The Jump ‘n Slide Bouncer from Little Tikes is a large inflatable kid’s gym in the shape of a play house. 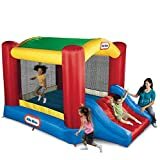 A real Bounce House for toddlers! 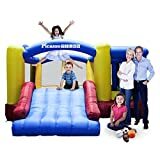 This inflatable bouncing house has an area of 100 square feet so you need quite a bit of room to accommodate your toddler gym. Designed for outdoor use, this Jump and Slide Bouncer can turn your backyard into a veritable kids playground. Some parents are lucky enough to have room indoors – in a garage or basement – to fit their kids bounce house. So they are able to play with this playhouse throughout the year. Included with this bounce house is a large slide with side rails. A fun, exciting way for kids to leave their playhouse! We particularly liked some of the safety features of this Little Tikes inflatable playhouse. There are high protective walls around the large kid’s jumping area. Stakes anchor the bouncer firmly to the ground. The Jump’n Slide’s two mesh doors, which have hook and loop fittings, permit parents to keep watch on their kids as they bounce, jump and slide. Please remember to always supervise young toddlers when they are playing on large activity toys like this inflatable playhouse. This bounce house comes with a continuous airflow blower to keep it inflated. This is a heavy duty blower but does not make too much noise. The Jump’n Slide Bouncer is made from a puncture resistant fabric and Little Tikes have also included a repair kit – just in case! This inflatable kids playhouse comes with its own storage bag. So it can be easily tidied away or even carried around to other kids yards for parties etc. If you take it to Grandma’s can I suggest she’s advised not to try bouncing! We can certainly understand why this Little Tikes inflatable bounce house won an Oppenheim Toy Portfolio Gold Seal Award in 2006. This large bounce house is bound to provide your young kids with heaps of healthy exercise and fun play times. Its attractively priced and very good value. because the solution to his problem (heavy boots!) just leads to yet another “challenge”. So often the case in my life too! If Mr Bounce were to have a playhouse, then an inflatable bounce house would be the best choice for him. Inflatable playhouses – especially ones you can jump and bounce on – are a great attraction at children’s birthday parties. Can I suggest a “no boots” and “bounce before cake eating” rule – personal experience speaking again. Prices are accurate as of April 25, 2019 8:21 am. Product prices and available are subject to change. Any price and availablility information displayed on Amazon.com at the time of purchase will apply to the purchase of any products.